Sign at the entrance to Calvary Cemetery. Conshohocken, Pennsylvania. Calvary Cemetery in West Conshohocken, Pennsylvania is near the major highway interchange where Interstate 76 (the Schuylkill Expressway) and Interstate 476 (a.k.a. "The Blue Route") intersect. 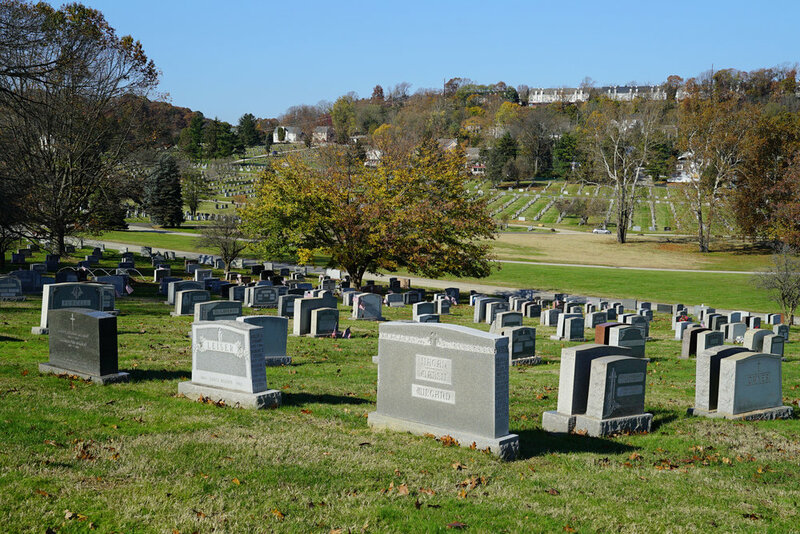 The cemetery was established in 1945 and is one of the 13 Archdiocese of Philadelphia cemeteries that was leased to publicly traded StoneMor Partners (NYSE: STON). News reports have said the lease could last for 60 years. In essence, Calvary is a for-profit cemetery now. This cemetery property appears to be well cared for. The stones are straight. The grounds are being maintained. It's an attractive place. Despite the close proximity of the interstate highways, I noticed no traffic noise... though that may have been because numerous mowers were being operated during my visit. Visiting hours are from 9:00 a.m. to 4:00 p.m. Monday through Saturday. And 10:00 a.m. to 3:00 p.m. on Sundays. This cemetery follows Archdiocese rules when it comes to monuments. To set a stone, make an inscription on a stone, or remove and replace a stone, a 4 page Archdiocese green form must be filled out by you and your monument dealer -- and notarized. Foundation fees begin at $317 for a 2 foot by 1 foot base. Note: All monuments placed at Calvary Cemetery must have something religious in the stone's design. Calvary Cemetery. West Conshohocken, Pennsylvania.